Just having fun. I do points. Impossible. No one who "does points" calls it "doing points". Compensation: "We understand that you were dissatisfied with the menu offered and we appreciate you taking the trouble to contact us. Please note that passengers can choose menu on our long haul flights up to 48 hours before the flight leaves"
I sell matzos and arba minim. 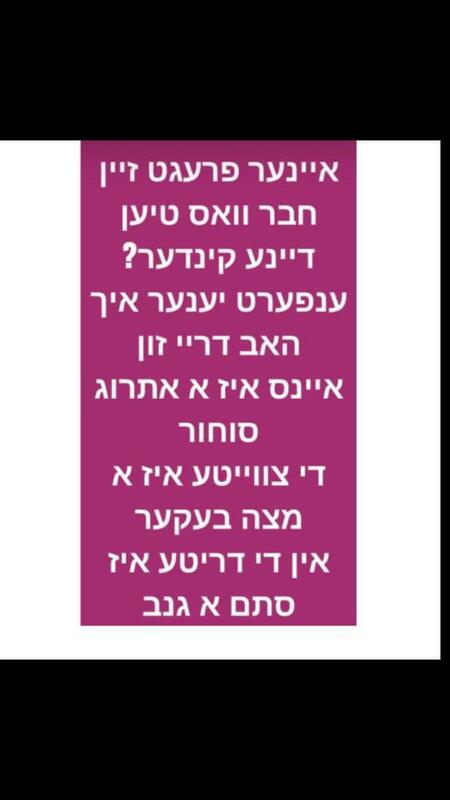 This isn't "arbah banim dibrah torah" no need to bring in the חכם. Been like that for some time. Yet more proof that jokes are funnier in Yiddish. Fissure. The punchline only goes in yiddish. My filter rejected Pie like I reject anything that isn't pie. After some minor freakouts and some time on the phone all looks nice. Downloaded Verizon's software update yesterday. Ugh. 9.0 Pepper Pickled Pizza Pie or whatever it's called. Draining my battery, I wanna undo that update. Gonna have to Google now to do that, but b out basically took a fantastic phone and sent it back years. Reminds me of my GS4!